Email Notification Not being Received. We recently filled out a form and have it linked to our site. Parents are filling it in, be we are not getting it through email like we typically do to see who is signing up. 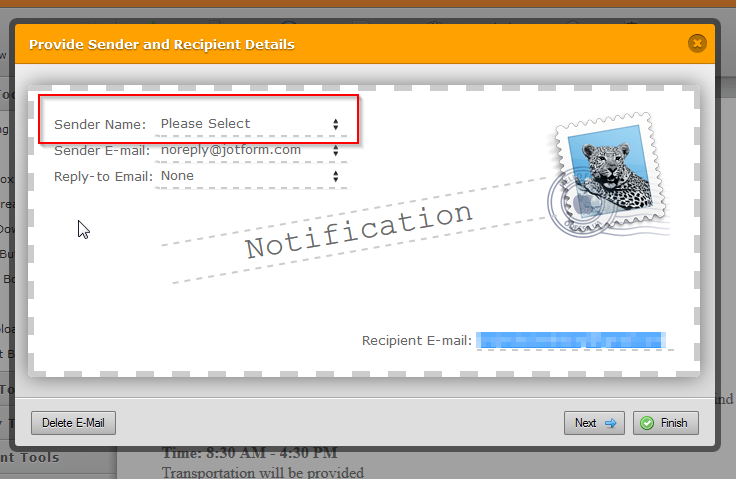 Upon checking your account and the form, I see that you did not select a value in the "Sender Name", this might caused a problem because your email provider might detect the email notifications as spam. I also check the recipient email that you have and it is not in our bounce list. Another way for you to assess and troubleshoot your email alerts is to try the following guides below. 1. You can see here all the submissions done in your form, you can see if the submission was successfully sent or not in your recipient email. 2. This is a guide on how to setup properly your notifications to prevent bouncing email related issues. 3. If you are using a custom email, like those provided in a hosting website, you may want to contact your email provider to whitelist our IP addresses so that the emails may not be blocked. I hope this helps. If the above solutions does not help you fix the problem, please do let us know. I am seeing a similar problem - previously I would receive an email when a form was completed. Now I do not get an email. I makes me lose confidence that the information entered in the form is properly being collected. I went to two most recently used forms and did test messages for each of the emails that were to be sent when a form was completed. Of the six emails that were sent as test messages, only four were received. I checked the spam folder and they did not go there. Please be noted that opening multiple threads on the same issue is not required.